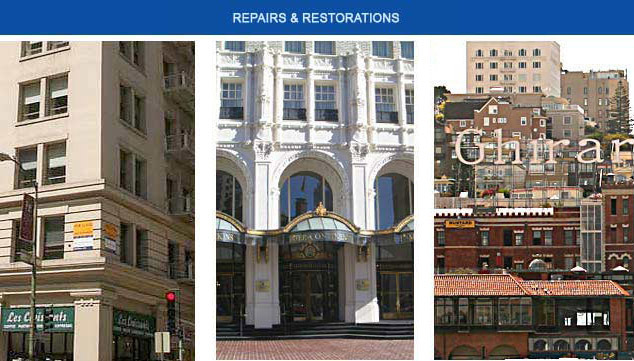 ARC is a full service General Contractor offering comprehensive building restoration and repair services in San Francisco and and throughout the S.F. Bay Area. ARC provides dry rot wood wall & deck restoration, concrete wall reconstruction and masonry wall restoration & repairs. Our systems re-establish the waterproofing integrity of the wall or deck we repair. Our repairs include any necessary window and door replacement. Among the restoration systems we offer are epoxy injection and epoxy flooring. We repair any deterioration, seal it, and restore the building to its original beauty. We've completed numerous challenging projects for high-profile San Francisco Bay Area clients.